The commissioners of the D.C. Advisory Neighborhood Commission 4C, which does not include Trump International Hotel, are supporting a petition signed by seven Democrats to revoke the liquor license from the hotel on the grounds of President Donald Trump not having "good character." The commission that represents multiple neighborhoods north of the Trump property, including Petworth and Columbia Heights, voted unanimously at their July 11 meeting to support the petition looking to strip the hotel of its liquor license, according to the Washington Post. 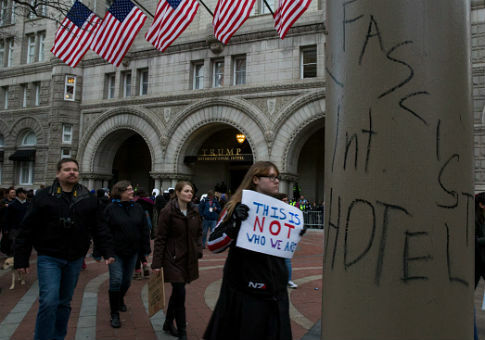 "It is our considered view that Donald Trump, the true and actual owner of the Trump International Hotel, is not a person of good character, doesn’t meet the D.C. Code … requirements and therefore the license should be revoked," ANC 4C chairman, Bennett Hilley, and vice chair, Charlotte Nugent, stated in a letter to the director of the Alcoholic Beverage Regulation Administration. ABRA spokesman Max Bluestein told the Post that any individual or civic group can file a complaint against a licensee. However, he said an ANC can't file an official protest against the liquor license if the business is not located within 600 feet of its jurisdiction, which is applicable in this case. The ABC board is required to respond to all complaints, such as ANC 4C’s letter, within 90 days, Bluestein says. Seven District residents — three reverends, two rabbis and two retired judges — filed the original complaint to the ABC board in mid-June. The complaint lays out in granular detail what Americans have been reading for months about President Trump: the accusations of sexual misconduct, the contractors who claim that Trump’s businesses haven’t paid them, the fraudulent practices of the now-defunct Trump University, the pattern of lies and deceptions and other allegations. ANC 2C, which covers downtown Washington, including the Trump International Hotel, says that it has no plans to weigh in on the June petition to revoke the liquor license at Trump hotel because they "do not take into consideration politics" when deciding whether a hotel should get a liquor license. ANC 2C chairman John Tinpe added that it would be "overreaching" to make the decision based on character. Josh Levy, the attorney who filed the complaint on behalf of the seven residents, insists that this is not a "political stunt" and that the seven petitioners believe Trump "is subject to the same good character requirement that applies to all other licensees. There is no statutory exception for the rich or the powerful." However, several of the petitioners have a history of support for Democrats and a conspicuous bias against Trump. William H. Lamar IV, the pastor of Metropolitan African Methodist Episcopal Church in Washington DC, has voiced his opposition to Trump since he was elected president in 2016. Less than a week after the election, Lamar said American evangelicalism is now the "official religion of white supremacy and empire" appearing to dismiss Trump's voting base as racists. He also participated in a press conference with other religious leaders calling on Congress to reject Trump's "Cabinet of bigotry." Lamar has also been arrested multiple times for protesting Trump's position on immigration and most recently protesting a Supreme Court decision he disagreed with, which led to him spending a night in jail for civil disobedience. Rev. Jennifer Butler, who was appointed by former President Barack Obama in 2015 to serve as a member of the President’s Advisory Council on Faith-Based and Neighborhood Partnerships, was quoted in a piece last June saying that she admired how the religious right was able to organize well for several decades. However, she is a staunch critic of Trump and voiced her opposition to Trump last year saying that the religious left was "morally outraged at what is going on and we are appalled at [Trump's] weaponization of religion." She has castigated Trump several times on Twitter, including a recent tweet accusing Trump of wanting to "obtain the right to torture immigrant children by putting them in prisons indefinitely." Aaron Potek, who serves as a Rabbi educator for GatherDC, which aims at helping 20 and 30-year-olds adjust to life in D.C., has also been critical of Trump and even wrote a blog post titled, "State of Mourning" on the GatherDC website a day after the 2016 election. In the post, he said, "Today we mourn the loss of the America we thought we lived in," adding that many of his Jewish colleagues were "too broken, too hurt, too angry to do anything but weep." In addition to liking multiple liberal organizations on Facebook, including "Barack Obama" and "U.S. Senate Democrats," he posted a rant against late-show host Jimmy Fallon for his "niceness" to then-candidate Trump when he touched Trump's hair. Dr. Timothy Tee Boddie, who currently serves as the general secretary and chief administrative officer of the Progressive National Baptist Convention, has voiced his opposition to Trump since before the election on social media, including tweets and retweets attacking Trump and questioning how he could be a presidential candidate in the first place. Boddie also sent out a press release in December 2017 on behalf of PNBC castigating the Republican tax reform legislation that Trump would later sign and tout. He sent out another press release earlier this year calling on the black church to "stand against the racism of of Donald Trump." Rabbi Jack Moline, who has served as the executive director of Interfaith Alliance since January 2015, was instrumental in assembling a group of 15 American rabbis to meet with White House officials, including Obama, at the beginning of his administration to discuss the "slippage" of his support among American Jewish voters and the negative perception that he didn't care about Israel. Despite this criticism of Obama, he supports many Democratic causes and has been an outspoken critic of Trump since before the 2016 election. A couple days after the 2016 election, Moline posted on Facebook that he believes it will be very difficult for him to be "fair to President Trump," adding that he "will probably evaluate him harshly based on [his] own biases." He also recently said that anybody that "still supports his efforts either agrees with him or has sacrificed all integrity." Moline, who refers to himself as "unashamedly liberal" on his personal website, has written several posts that criticize Trump and accuse him of not being "honest" and saying that the next president "will need to restore a sense of humanity to the White House." He also wrote a piece in the Huffington Post accusing Trump of stomping on the Constitution and validating "violence against dissenters." The other two petitioners, inactive Senior United States District Judge Henry Kennedy Jr. and retired magistrate judge for D.C. Superior Court Joan Goldfrank, have Democratic backgrounds, but their political views on Trump are not widely shared on social media. Kennedy was appointed by two Democratic presidents, Jimmy Carter and Bill Clinton, for his Federal judicial roles. His sister is also close friends with former First Lady Michelle Obama. This entry was posted in Politics and tagged Bill Clinton, Donald Trump, Jimmy Carter, Michelle Obama. Bookmark the permalink.